When you buy a good rack of lamb, the sky is the limit on how to best cook it! In most restaurants you will find the rack of lamb ‘frenched’, where the rib bones are exposed by cutting off the fat and meat covering them for better presentation. But that’s not how the Greeks like their lamb! Most Greek recipes call for the lamb to be cut into small rib chops, called ‘paidakia’ also called ‘Greek lamb chops’. A rack of lamb is the entire set of ribs (usually 8) and these small ribs (paidakia) can be purchased and served “single cut” (with one rib bone) or “double cut” when too small. Greek lamb chops (paidakia) – The ultimate Greek delicacy! Of course the best option is to grill the paidakia (Greek lamb chops) on a char-coal barbecue, to get them all crispy and smokey. However they also work great on a grill pan or in the oven, if you don’t have the time or space for a proper barbecue. Cooking time varies greatly, mostly depending on how well done you like your meat. Most Greeks are not big fans of medium-rare, hence most tavernas offer the paidakia (Greek lamb chops) well done. Traditionally Greek lamb chops are marinated in olive oil, mustard, fresh thyme, garlic, lemon zest and peppercorn. Seasoned with salt and fresh ground pepper and finished with a last minute squeeze of lemon and dried Greek oregano. Simply delicious! 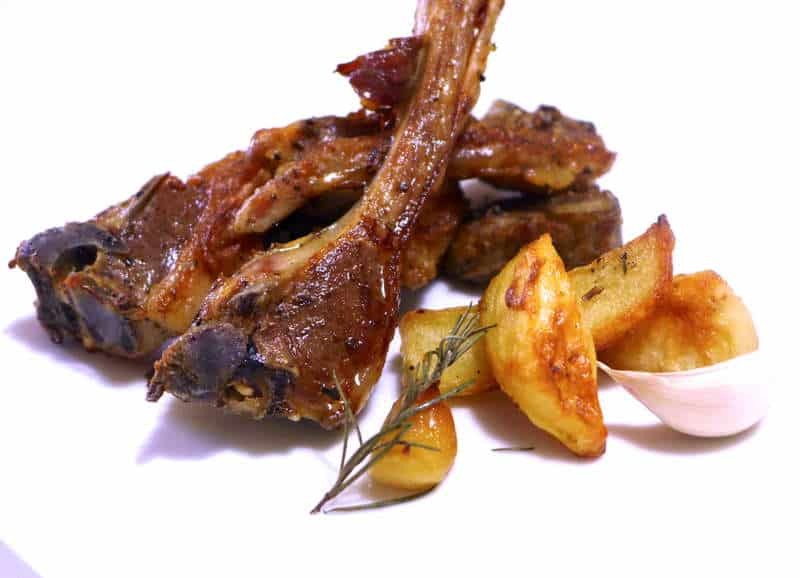 In Greece when preparing Greek lamb chops (paidakia) it is an unwritten rule to add the potatoes in the same pan with the lamb so that they soak in all the juices and aromas from the meat. The main drawback is that the potatoes are not as crispy as when baked on their own. So it’s up to you to decide if you want to sacrifice a little crispiness for that extra flavour. If you choose to roast your potatoes on their own then try these extra delicious crispy Greek lemon potatoes. Alternatively you can drizzle the potatoes with some of the lamb juice and get the best of both worlds! Serve these delicious Greek lamb chops (paidakia) with a nice Greek salad and of course some extra garlicky and cooling tzatziki sauce. Enjoy! Oh and you can always read this delicious recipe in Greek here Αρνίσια Παϊδάκια στο φούρνο με πατάτες. Cut the potatoes into wedges and place them on a large metal roasting pan. Into a bowl add the remaining ingredients and blend. Pour the mixture over the potatoes and season well with salt and pepper. (The potatoes and the ‘paidakia’ cook at different times, so you should add the lamb chops later, about 20-30 minutes before the end of cooking time). Is the mustard, dry spice or the condiment form? Should I take the golden potatoes out of the oven half way and then put the raw marinated rack of lamb on top of them?